If you’ve somehow managed to land on this page, you’re probably looking to purchase an affordable riding lawn mower. 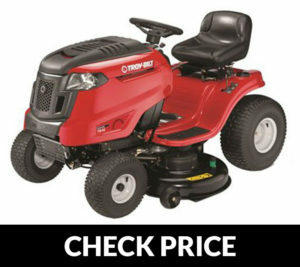 Unfortunately, riding mowers and lawn tractors can be far from cheap. Finding the best lawn tractor for the money can be especially difficult. They are usually several thousand dollars and rarely come at a discount, but there are some exceptions. With our reviews, you will be able to decipher the complicated market and find the best riding lawn mower for the money. First, let’s start with the different types of riding mowers and the implications of each. Note: Zero turn lawn mowers were not included in this assessment as they are much more expensive than other types of riding mower. Here’s our article on ZTR mowers. The two main categories of riding mower include rear engine mowers and lawn/garden tractors. They are both intended for private use on properties that are around an acre or more. Both types of mower will be more efficient than the typical pushing mower, and the exact mowing speed will depend heavily on the model that you select. If you want more information regarding the exact differences between each type, check out riding lawn mower reviews. Rear engine mowers will almost always be cheaper than a tractor, but the exact price difference depends on the exact models. Their price difference is created by several different factors. Firstly, a rear engine mower is more bare-boned and can only do the singular job of mowing grass. Tractors usually feature larger engines, more rigid frames, and a wider cutting deck. All these factors contribute to a higher price tag. Generally speaking, tractors are more costly than rear engine mowers. Both types will be able to cut grass obviously, but what differentiates one from the other? Well, rear engine mowers are usually best for lawns that feature mostly flat land with little obstruction. They should not be used for lawns with slopes as the weight distribution favors the rear due to the engine. A steep enough slope will cause the mower to flip backwards due to the weight of the engine. These mowers usually have an engine and frame too weak to do much other than simply mowing. Lawn or Garden tractors are better suited for individuals that plan to do gardening work outside of just mowing. Although they tend to be more expensive, lawn tractors are able to utilize attachments for tilling, plowing, and other lawn maintenance tasks. They will also be better suited for larger lawns as they usually have a wider mowing path. Their larger engines are much more powerful and capable of pulling heavy objects such as a tiller. So to answer the question of which one is the right for you, take a look at your lawn and determine what tasks you have in mind. 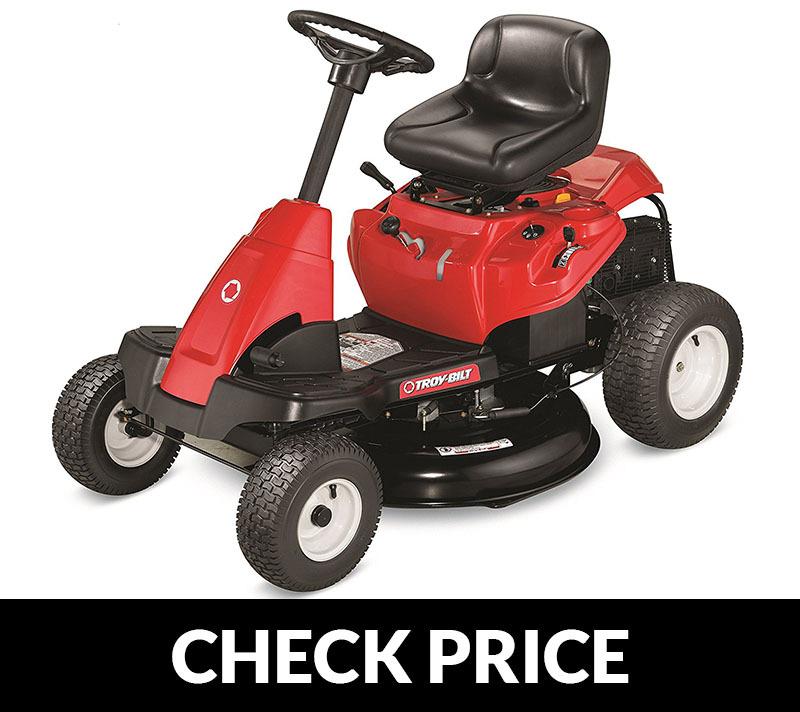 Since you’re looking to purchase an inexpensive riding mower, it may be a better option for you to purchase a higher end pushing mower instead. Its much better to invest in honda hrr216k9vka rather than a cheap riding mower that may break constantly and need excessive maintenance. Although pushing mowers may take longer to mow your lawn, it will be perfectly suitable for lawns under an acre in size. Some advantages include less maintenance costs and a smaller size. If you want to know how the best pushing mowers perform, check out our article on the best lawn mower. Otherwise continue reading about the best lawn tractor for the money. At this point you should be able to determine which type of riding mower is better suited for you. Using this information, carefully consider each offering on our list. 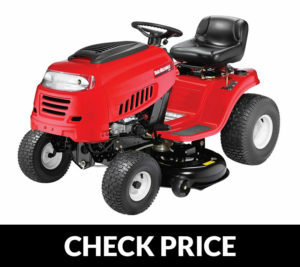 Both lists will feature riding mowers under $1500, but if you are looking to spend a little more, check out the more expensive lawn tractors as well. They will be able to perform many more tasks outside of simply mowing and this may be a useful feature for gardening hobbyists and others who like to tend to their yard’s aesthetic. 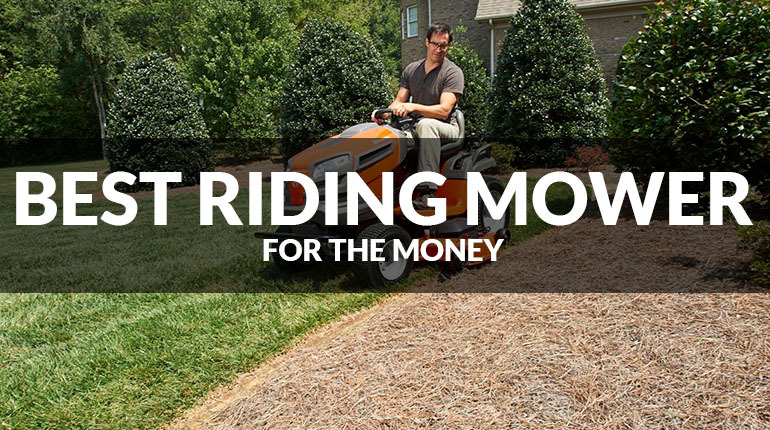 Without further ado, here are the top riding mowers for the money. 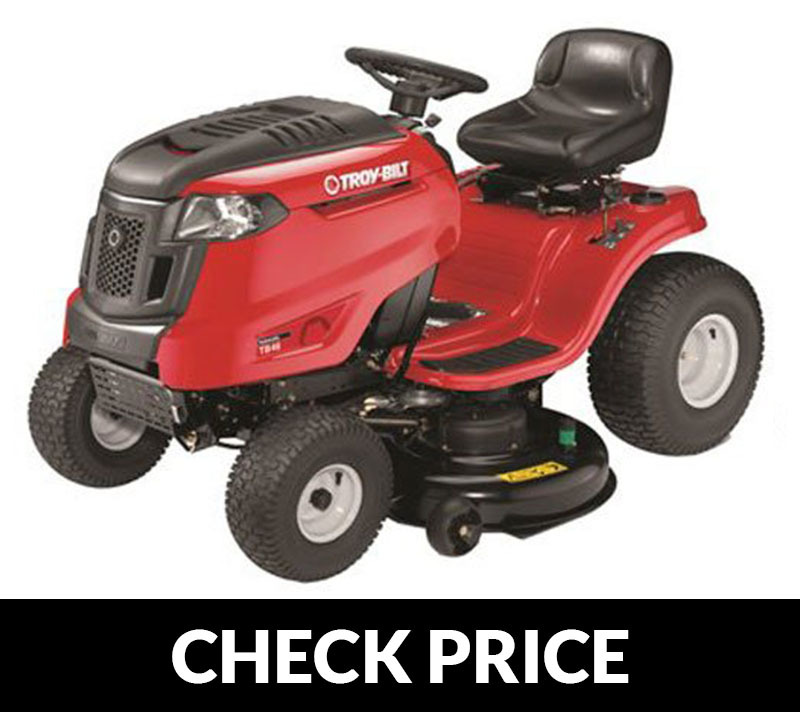 The Troy Bilt riding Mower is easily the best value on the market today. Although it features little other than the bare minimum, it does its job of cutting grass with efficiency and ease. The company Troy-Bilt is a big brand in the industry and it produces its own engines for this mower. It produces enough power to move at a top speed of 4.5 mph, and combined with its 30” wide cutting deck, this mower will shave a significant amount of time off mowing. 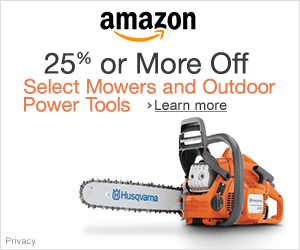 The 6-speed manual transmission might be a little jerky and take some time to master, but with a 2-year warranty included and Amazon’s satisfaction guarantee, there’s no reason not to give this mower a go. Coming from one of the biggest names in commercial gardening equipment, the Husqvarna YTA18542 is a trustable machine built with several convenient features. 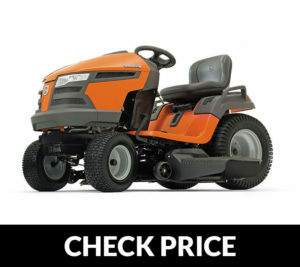 Even at such a low price, Husqvarna has managed to pack this tractor with an automatic transmission, patented air induced lift technology, and a 3 year limited warranty. It operates smoothly and drives responsively unlike other budget options. The engine provides ample power for the blade and wheels and is definitely powerful enough to drag small to medium sized objects. 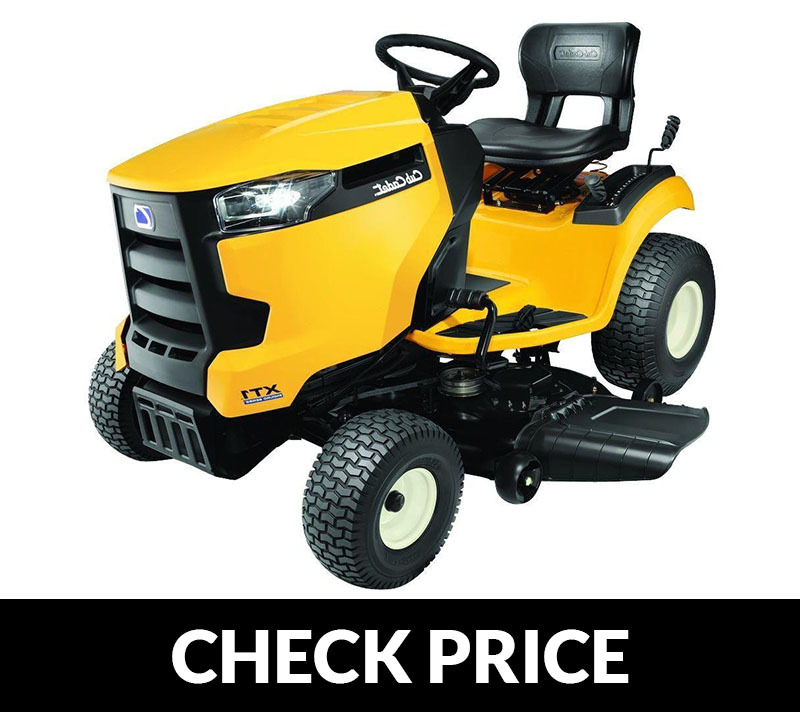 With its large 42” cutting deck, this tractor will cut grass quickly at a steep discount compared to other similarly sized models. If the two previous models were too large for your storage space, we recommend checking out this smaller model that features a much smaller 24” cutting deck. The engine is much smaller and more fuel efficient than the previous mowers, but this comes at the cost of less power. Because the price is essentially the same, we recommend you to buy this model only if storage or maneuverability are an issue for you. This mower will turn tighter but will definitely mow slower. Cub Cadet mowers come at a steep discount thanks to their production and sales process which features little other than producing and selling through Amazon. This allows the company to keep costs low as there is no additional expenses other than manufacturing the product and shipping to Amazon’s warehouse. These mowers are of an exceptional quality considering their cheap price tag. It comes with many premium features such as a comfortable seat, powerful engine, and a tight turning radius. These models are offered at a discount on Amazon exclusively, and we highly encourage you to check them out. One of the cheapest lawn tractor’s available today, the Yard Machines 30” tractor is the best value option for those with slightly hilly terrain that cannot be mowed with the standard rear engine mower. It features a 7-speed manual transmission that involves a slight learning curve and may be a bit of a hassle to operate at first. Otherwise, this mower is great at cutting grass quickly with a 420cc engine and a wide 42” cutting path. Back by a limited 2-year warranty from Yard Machines, this mower is great for individuals just getting into the tractor market. Budget riding mowers come with a whole list of common issues that rise for many users after a few seasons of use. Obviously this is due to the cheaper manufacturing process used in the budget market. Factories cut corners on higher quality parts and quality control to achieve such an affordable price tag. This leads to inferior products that suffer in durability. Nearly all of these problems can be avoided with vigilant maintenance and proactive replacements. Don’t let these issues scare you away from the budget market. Just make sure to do your research before buying a model and check to see the most common customer complaints. This is the most common complaint with cheap riding mowers. A misaligned steering column, however, is usually a pretty easy fix with the proper tools. Depending on the mower this may be a problem with several different components, but they should all be replaced under warranty or easily at home. Poor and uneven cuts is probably the most annoying problem you can face with any lawn mower. Unfortunately this problem is a lot harder to diagnose as a lot of components play into the performance of the cutting deck. It could be a whole host of issues including but not limited to a dull blade, weak engine, deflated tires, and much more. If a riding mowers engine starts to feel sluggish and no longer responds well to the gas pedal, the most probably cause of the problem is the carburetor. This is the component that mixes fuel with air for combustion in the engine. This problem may be harder to fix at home but will most likely be covered under warranty. A completely dead engine is almost always caused by negligent maintenance and infrequent fluid changes in the mower. Remember that riding mowers must be maintained regularly at home or by a professional to operate smoothly. This problem should almost always be taken care of at a dealership or other professional mechanic. If you want additional information regarding common issues with riding mowers and how to troubleshoot them, check out Sear’s article.